The last week has been an interesting one photographically, and of course it always is. To start, I had a very fruitful day early last week, where I exposed the image above. The light, ice, and snow were nice all day, and it wasn’t too cold to spend a 7 hour day out with the camera. I enjoyed it, and I think I made some other good exposures. Before I move on, what about the same exposure rendered in black and white? Thirty five years ago, when I used 4 x 5 sheet film, it would be a no-brainer: of course it has to be black and white. But I find I love the subtle colors in the image above. A photographic friend once said of me that I make color photographs like I’m working in black and white (I’m not sure it was a compliment from him). But personally I’ll take it as a compliment. For me, form, texture, tone very often take precedence in deciding a composition, but lately color is a bigger influence as well. As an option, here it is below in black and white. I think I’ll put them both on the site for sale until it is clear which is better. Anyway, it was an interesting week, as I said. After this great camera day, I had a let down from a potential vendor of my work. We’ll still see about that. But it felt like a blow. And then I think the next day, or day after that, I got an out-of-the-blue email from the office of one of my Vermont Senators, Bernie Sanders. Yes, Bernie. They asked if I would be so kind as to let them hang some of my Vermont images in their DC office. Umm, yes, I would be flattered. Then another camera day, yesterday. It was a promising camera day, beautiful new snow lacy on all the trees, some rime ice in some places, and nice ice over rivers and streams. The only problem was that about 2/3 of the way through my stamina and camera battery supply, I fell through some ice into a stream, about belly-button height or higher. I was too busy to take careful notes at that moment. The water was ice cold and running fast. It was all I could do to pull myself up on the ledge of ice. (I noticed later I scratched my hands and wrist in that endeavor.) I had a camera backpack and a side-bag full of gear. The side-bag was floating. All the gear stayed dry enough, except the micro four thirds Olympus, not my main camera, but I love it, and on it was a lens I love. They fell in the water as I tried to scramble out. I fished them out and am drying them, though I think the lens is a loss. Besides being quite miserable for some time until I got home and dry, I was pretty bummed out about that lens. The camera, we’ll see. It didn’t seem to take on much water, and it’s quite a weatherproof wonder. Also this last week, my ancient car, which has had charging system trouble since November, has made it clear that it is still not working. I was nervous climbing up the riverbank to it, soaked through, in about 15 degree F temperatures, not 100% sure it would start. It did. Being that wet and not sure the car would start was damn scary. It’s an 18 year old Volkswagen, which I’ve really loved for all these years, my favorite car ever. But now I think it’s time to get rid of the damn thing. So, ups, downs, and my mind continues along, stumbling and soaring, as it does. One Buddhist teaching on this as aspect of life is formulated as “The Eight Worldly Winds,” or often, “The Eight Worldly Dharmas.” In life we sometimes get praise and sometimes blame. Sometimes fame, and sometimes its disrepute. We get things that we want, but then we lose them — we can’t keep anything permanently. So there is always gain and loss. Likewise with pleasure and pain. Though obviously derived from the Buddha’s teachings, I’m not sure it was formulated and presented as this list of 8 pairs of opposites in his time. I’m guessing as a list it comes from the Nalanda period in India, around the ninth century, but I’m not a real scholar of this, and there is a lot of pseudo scholarship online. Between the idea of the title of “The Eight Worldy Dharmas” vs “The Eight Worldly Winds,” I like the Winds better. Right at the start, you get the idea. There are these winds always blowing us around. We are pulled and pushed by our attraction, aversion, and ignorance. We can tend to go off to the races every time the winds blow, or we can train to understand that this is just what happens as humans in this world and take our seat to watch the display without getting quite so caught. I like this teaching, this view, because it is basically neutral. Of course, as humans, things happen and then we respond emotionally. No blame. It’s just that we’re better served if we place our allegiance with awareness rather than with the emotional tides. 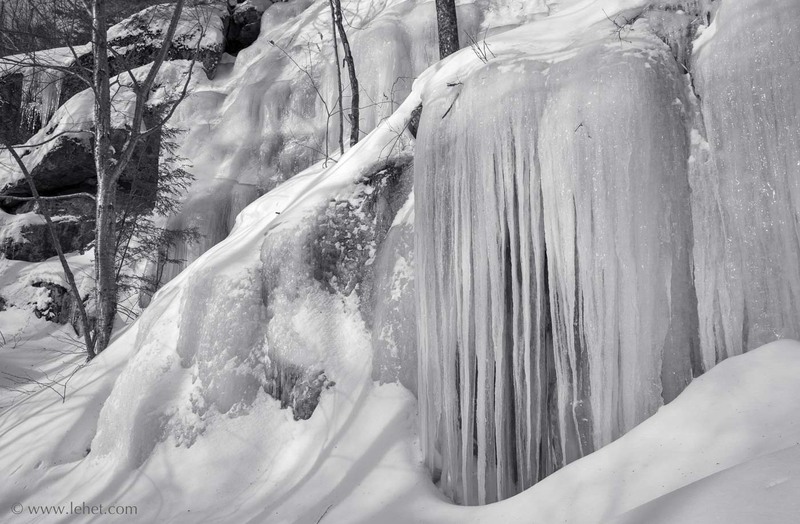 This entry was posted in black and white, Buddha, Ice, Life, Meditation, Musings, Vermont, Winter on January 19, 2018 by john lehet.